Pinan Godan is more difficult to characterise than the earlier Pinans; there are fewer mirrored sequences, which allow you to delimit drill sequences within the kata, in fact there are only the two, the starting movements and the ending movements. This can make analysis (bunkai) far more difficult and is closer to the older katas in terms of difficulty. Having said that, it is short. Things like a mawshi-empi-uchi into an empty hand can indicate a final movement in a sequence because typically the opponent's head will be in between but often you have to run a sequence until the opponent is defeated in some way. This is unfortunately trial and error. Turn left 90° and execute uchi-ude-uke with the left hand and left leg forwards in nekoashi-dachi (kokutsu-dachi for the Heian variant). Punch gyaku-tsuki at chudan level with your right arm. Bring both feet together and rotate 90° clockwise to face the front in heisoku-dachi. 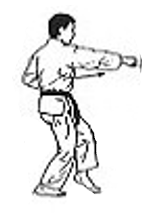 Simultaneously pull the right hand to the hip with hikite and with the left execute mawashi-tsuki (hook punch). In the Heian variant this is done slowly to indicate resistance. Turn right 90° and execute uchi-ude-uke with right left hand and right leg forwards in nekoashi-dachi (kokutsu-dachi for the Heian variant). Punch gyaku-tsuki at chudan level with your left arm. Bring both feet together and rotate 90° anti-clockwise to face the front in heisoku-dachi. 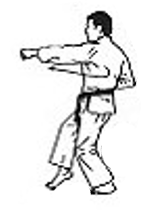 Simultaneously pull the left hand to the hip with hikite and with the right execute mawashi-tsuki (hook punch). In the Heian variant this is done slowly to indicate resistance. Execute morote-uke with the left arm and leg to the front in nekoashi-dachi, or in kokutsu-dachi for the Heian variant. Step forward in to zenkutsu-dachi with the left leg to the front and execute gedan juji-uke. Remaining in position, execute a jodan shuto juji-uke. Bring your hands down to chest level. Reverse your open hands; you begin with right on top of left, by rotating at the wrist reverse the position so the left hand is on top of the right. Pull the right hand to the hip with hikite and punch with the left hand simultaneously. In some Pinan variants the body rotates 90° clockwise during the movement. In the Heian variant, an open hand shuto-uchi is used rather than a closed handed punch. Step forward with the right leg into zenkutsu-dachi and punch with oi-tsuki. Rotate 270° anti-clockwise while stepping out into shiko-dachi (kiba-dachi in the Heian variant). Many styles explicitly raise their right arm during the rotation prior to the block, in the Heian variant it is raised over your head. Block gedan-barai to your right. [Some Pinans] Remaining in shiko-dachi stance, turn your head left to face the other direction and strike tettsui-uchi with your left hand. [Some Pinans] Turn your body left to face the other direction in zenkutsu-dachi and strike tettsui-uchi with your left hand. [Heian] Remaining in kiba-dachi push out to the left with chudan shuto-barai. [Some Pinans] Step forward in zenkutsu-dachi with right leg and with right arm execute mawashi-empi-uchi into your left hand. [Some Pinans] Step forward rotating 180° into shiko-dachi and and with right arm execute mawashi-empi-uchi into your left hand. [Heian] Step forward rotating 180° into kiba-dachi, kick your left hand before executing mawashi-empi-uchi into your left hand. Execute morote-uke to the front with your right arm as you bring your rear left leg up into heisoku-dachi. Turn anti-clockwise 180° and step out into nekoashi-dachi with the left leg. Strike vertically upwards with your right arm from the morote-uke. [shotokan, wado-ryu] Step on to your left foot and jump while rotating anti-clockwise 90°. [shorin-ryu, shito-ryu] Step out with your right leg into a long but transitional shiko-dachi. Block downwards with gedan juji-uke while in kosa-dachi with your right leg to the fore. Shorin-ryu perform the block with the left knee on the floor. 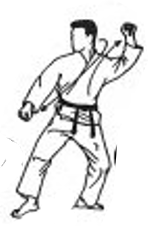 Step up rotating to your right into a zenkutsu-dachi with your right leg to the front. Execute morote-uke with your right arm. [Pinan] Turn 180° into kokutsu-dachi with the left leg forward and block to the front and rear with manji-uke; or simultaneously a gedan barai to the front with the left hand and a jodan uchi-ude-uke to the rear with the right. [Heian] Turn 180° and step forward into zenkutsu-dachi with your left leg forward and strike gedan nukite-uchi with your right hand. Move your front foot across into kokutsu-dachi and execute manji-uke or simultaneously a gedan barai to the front with your left arm and a jodan uchi-ude-uke to the rear with your right. Bring your front foot to the back into heisoku-dachi. Rotating your body anti-clockwise 180°. [Pinan] Step forward into kokutsu-dachi with the right leg forward and block to the front and rear with manji-uke; or simultaneously a gedan barai to the front with the right hand and a jodan uchi-ude-uke to the rear with the left. Note that shito-ryu and wado-ryu styles perform this movement at an angle of 45° to the right while shorin-ryu perform it to the front. [Heian] Step forward into zenkutsu-dachi with your right leg forward and strike gedan nukite-uchi with your left hand. Move your front foot across into kokutsu-dachi and execute manji-uke or simultaneously a gedan barai to the front with your right arm and a jodan uchi-ude-uke to the rear with your left.